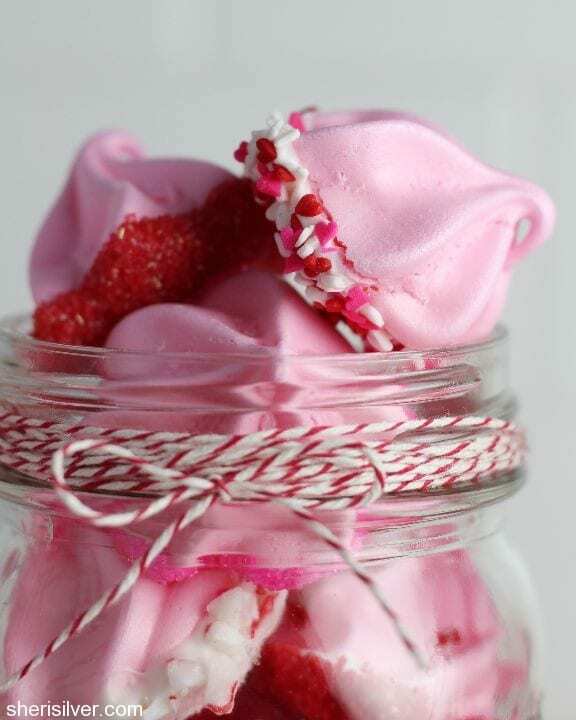 meringue kisses for valentine’s day! If you’re looking for an easy treat to give friends, teachers and loved ones for Valentine’s Day – well, look no further! 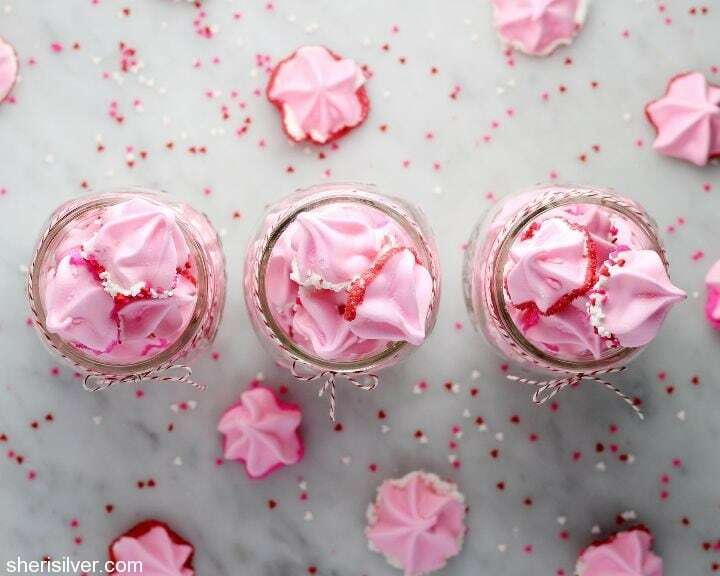 I used my foolproof method for perfect, crispy meringues – tinted pink, piped into little kisses and dipped in melted white chocolate and a variety of toppings! Meringues are naturally gluten-free, and if you use the appropriate chocolate, these can be dairy-free too – making these a sweet treat for classroom celebrations (or loved ones who have a food allergy/sensitivity)! 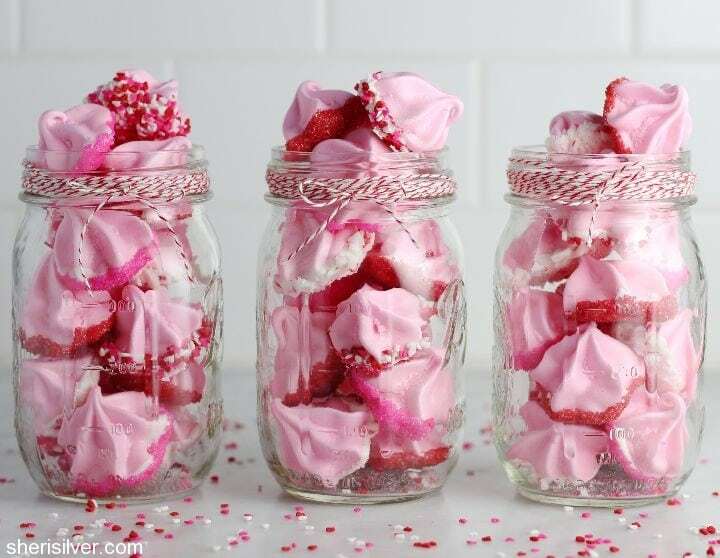 Scroll down for all of my Valentine’s crafts and recipes! Pre-heat oven to 200 – place racks on upper and lower thirds. Line 2 baking sheets with parchment paper. In a food processor, grind the granulated sugar for several minutes, till very fine – set aside. In a mixing bowl beat egg whites on low speed till frothy and completely covered in tiny bubbles. Add cream of tartar and increase speed to medium, gradually adding 2 tablespoons of the processed sugar. When soft peaks form when the beater is raised, add another tablespoon of the sugar and increase speed to high. When stiff peaks form add the remaining sugar and beat until stiff and glossy. 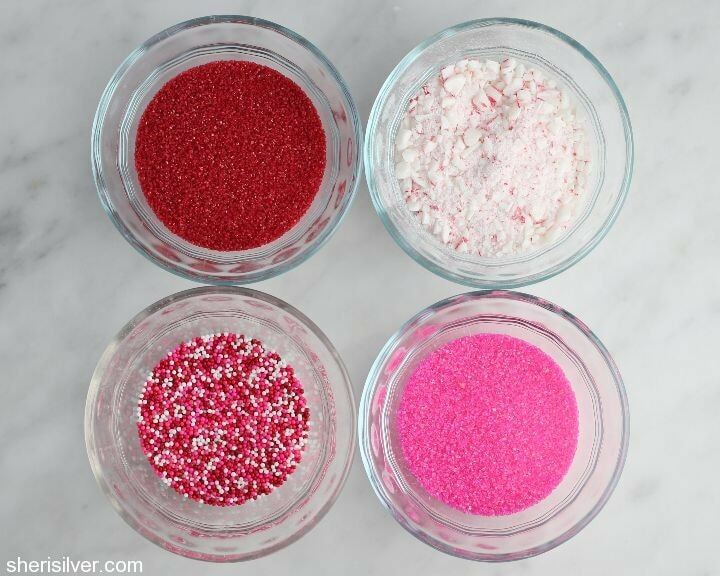 Fold in the powdered sugar and enough food coloring to achieve the desired shade. Scoop meringue into a pastry bag fitted with a star tip. 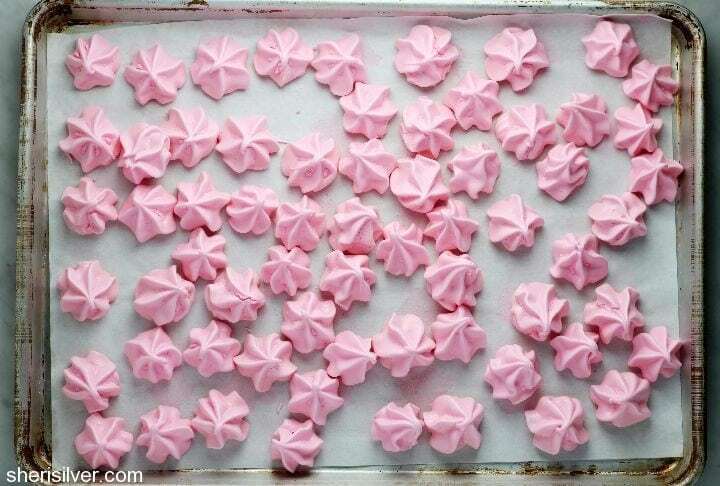 Pipe small “kisses” onto your prepared baking sheets, spacing them fairly close together. 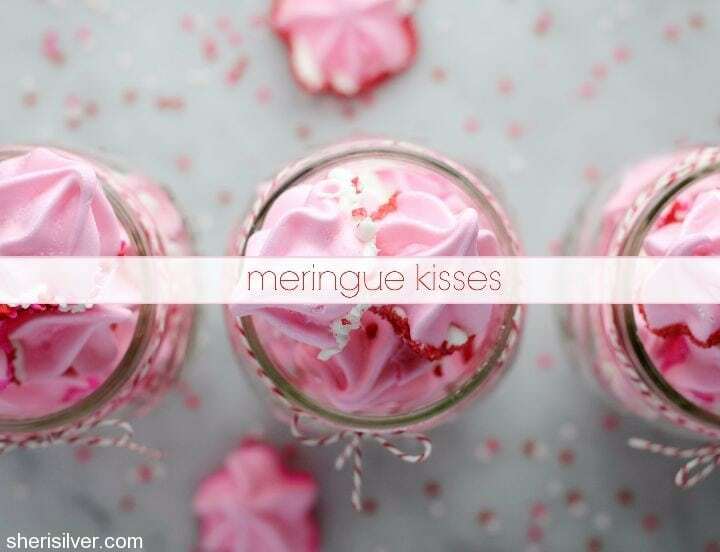 Let the meringues sit for 30 minutes, till set – they should stay intact when lightly touched. Bake for 2 hours, or till dry and crisp but not at all colored. Transfer to cooling racks to cool completely. Re-line the baking sheets with parchment paper. Melt the white chocolate in the top half of a double boiler set over barely simmering water. Working with one kiss at a time, dip the bottom into the melted chocolate, then immediately into one of the toppings. Place on your baking sheet and repeat with remaining kisses. Let set, and store in an airtight container.